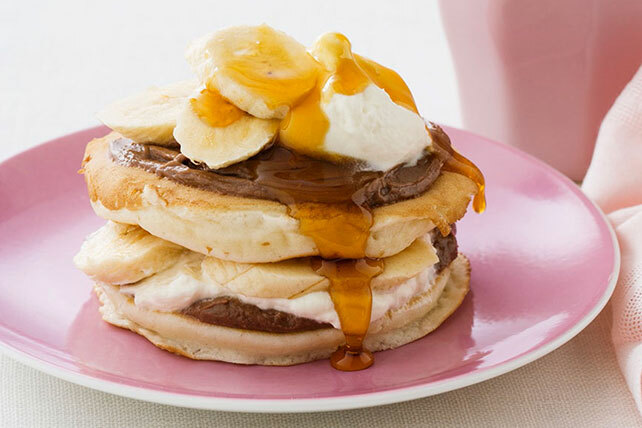 Try our Easy Banana Pancakes - they are crowd-pleasing pancakes made from scratch, with a fun twist on ordinary pancakes. Mix first four ingredients until blended. Whisk together egg, milk, sour cream and vanilla in medium bowl. Stir in flour mixture. Heat griddle or large skillet, brushed lightly with oil, on medium heat. Pour batter onto griddle, using 1/4 cup batter for each pancake. Cook until bubbles form on top; turn to brown other sides. Remove to plate; cover loosely with foil to keep pancakes warm while you make the remaining pancakes. Serve with sliced bananas, Cool Whip and maple syrup.